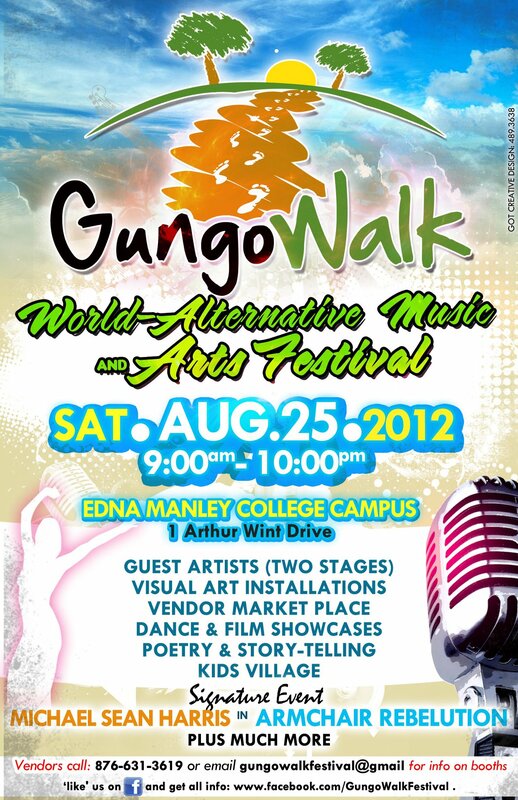 Joy Mechanics in collaboration with The Edna Manley College presents the first annual staging of the Gungo Walk World-Alternative Music and Arts Festival. The festival takes place on August 25, 2012 at The Edna Manley College of the Visual and Performing Arts campus. The festival is about promoting and showcasing artistes performing alternative, folk and experimental expressions of music in the Jamaican, Caribbean and International experience. It will attract visiting artistes as well as audiences who are interested in alternative music, world; ethnic music as well as homegrown music forms. Expect to see performances from SEZi, Black As Cole, StoneDub, Blu Grass in the Sky, Suzanne Couch, One Drop RoutZ, Mystikal Revolution, Tableaux Centre for the Performing Arts, Charmaine Limonius, Michael Sean Harris, and Di Blueprint Band. In addition, there will be authentic international cuisines (Mediterranean, Indian, etc) from our local restaurants, games and attractions for children, fashion show, art, dance, photography, poetry, film features and workshops. The day will climax with the main musical showcase “ArmchairRebelution” featuring special guest artist Tessane Chin. Reblogged this on o-access JAMAICA.